AI systems can be trained to help astronomers identify if galaxies are still active in producing new stars, according to a new study published in The Astrophysical Journal. A team of researchers have built a convolutional neural network to identify galaxies at various evolutionary stages. Galaxies are mostly massive blobs of gas, dust and stars and it can be difficult to study how they evolve over time as it unfolds over billions of years. Scientists have had to piece together the process by taking snapshots or creating simulations of different galaxies in the past. But the convolutional neural network (CNN) appears to be able to make the right call around 80 per cent of the time. The rate of star formation in galaxies has been connected to the different life stages of galaxies. Young galaxies are still active and have bright, active stellar nurseries, making them appear blue. Old galaxies, however, have used up their material and rarely produce new stars and are cooler so appear more red. In simulations of galaxies, gas is funnelled to a central, dense, star formation region called a “blue nugget”. The idea of using colour to study galaxies can be split into three stages. When a galaxy is in the early stages and star formation has not reached its peak it's called pre-blue nugget. When the galaxy is undergoing active star formation it's considered the ideal blue-nugget stage, and then the post-blue nugget stage comes when star formation has been quenched. Image credit: Top two rows: Greg Snyder, Space Telescope Science Institute, and Marc Huertas-Company, Paris Observatory. For bottom row: The HST images are from the Cosmic Assembly Near-infrared Deep Extragalactic Legacy Survey (CANDELS). The researchers simulated 35 galaxies in different stages of evolution, but only used 28 in the training process: 24 for training, two for validation, and two for testing. The training process was repeated five times, using two different galaxies as test subjects for each run. “We stress that we are fully aware that the simulations present many limitations and that they are still very far from capturing all the complex physics of galaxy formation. This is mainly why the present work needs to be considered as a proof-of-concept work in that respect,” the researchers admitted in the paper. The model reaches an average of about 80 per cent accuracy. The researchers also tested it on real data taken from the CANDELS project (Cosmic Assembly Near-infrared Deep Extragalactic Legacy Survey), infrared images taken by the Hubble Space Telescope. It found that the galaxy’s different phases of ‘blue nuggetness’ depends on the mass of its stars. 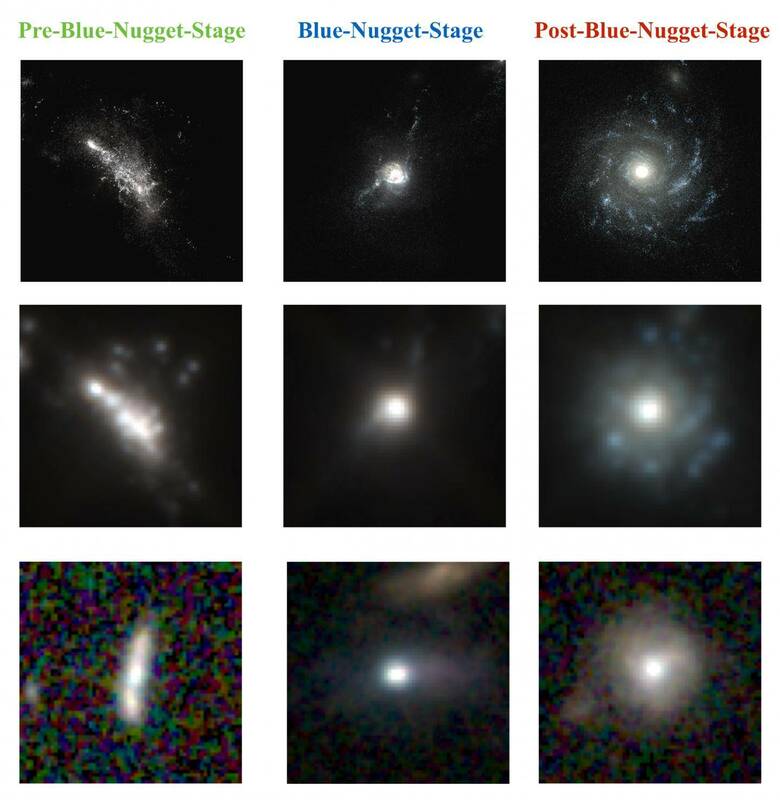 Pre-blue nugget galaxies tend to have stars with lower masses, blue-nugget galaxies have intermediate masses, and post-blue nuggets galaxies are heftier. “It may be that in a certain size range, galaxies have just the right mass for this physical process to occur," said David Koo, coauthor of the paper and a professor astronomy and astrophysics at University of California, Santa Cruz. "Deep learning looks for patterns, and the machine can see patterns that are so complex that we humans don't see them. We want to do a lot more testing of this approach, but in this proof-of-concept study, the machine seemed to successfully find in the data the different stages of galaxy evolution identified in the simulations," he said.